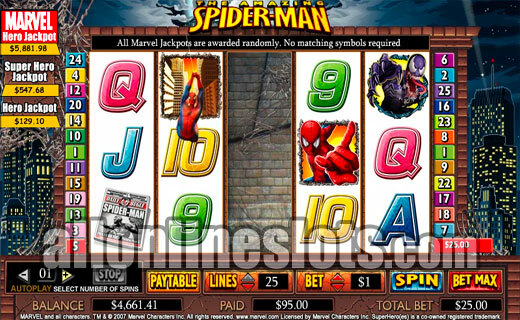 Spiderman is a Marvel Jackpot slot by Cryptologic. It's a 25 line game with a 25 coin max. The spiderweb feature is triggered by the wilds and the scatters trigger a feature where you can choose from free spins or the Venom Bonus. 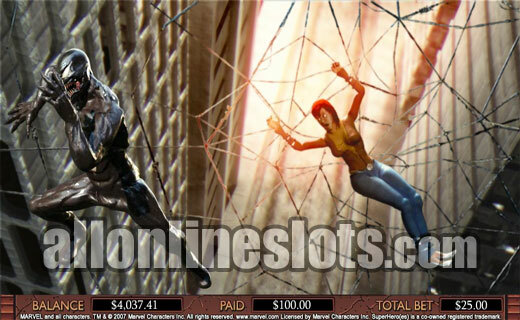 One of the biggest slot machine releases of 2007, Spiderman swings into action at all Wagerlogic powered online casinos. You can see that the developer really went a step ahead with this game as it has three bonus features including a very impressive animated multi stage bonus game. Peter Parker AKA Spiderman has been appearing in Marvel comic books since the early 1960's. More recently the character regained popularity with a series of motion pictures. Fans of the comic and the movies will instantly recognize the Mary Jane symbol as well as the Venom symbol. The game uses the 25 line format and has a 25 coin maximum bet. You can choose from the following coin sizes - 1¢, 2¢, 5¢, 10¢, 25¢, 50¢, $1, $2 and $5. Maximum bet ranges from 25¢ to $125 per spin. The bigger you bet the higher the potential jackpots and the higher your chances of picking up one of the random progressive Marvel Jackpots. The Spiderman symbol is wild but only appears on reels 2 and 4. The wild symbols sub for everything but the scatters and also activate the first of the games three bonus features. The Spiderweb feature is won when you get a wild on both reels 2 and 4. The resulting wins are paid and then all of the symbols are held in place. The middle reel then becomes wild and any further win are paid. This effectively means you can get three wilds on the middle three reels. so you only need the jackpot symbol on the first and last reel to hit a big pay day. The top jackpot is 5,000 coins which is paid for hitting five Venom symbols on an active pay line. Other good pays include 2,500 coins for five scattered Spiderman logos and 1,000 coins for five Mary Jane symbols. In total there are 36 winning combinations ranging from 5,000 to 5 coins. The scattered Spiderman logos are your ticket to the second and third bonus games. Get three or more and you move on to the bonus selection screen. Here you can choose to play Free Spins or have a shot at the Venom Bonus. If you select the free spins you win 15 free games with all prizes paid double. Extra wild symbols are added to reels 2 and 4 but for some reason the developers decided that the Spiderweb feature cannot be triggered during the free games. The free games also can not be re-triggered. If you select the Venom Bonus you move on to the multi-stage pick a box style bonus. Here you get a great 3D animation of Spiderman swinging through the city in search of Venom who has kidnapped Mary Jane. You have to select which way Spiderman should go (View Screenshot). There are multiple outcomes for the bonus game. If you find Venom you get a fight scene between the two. 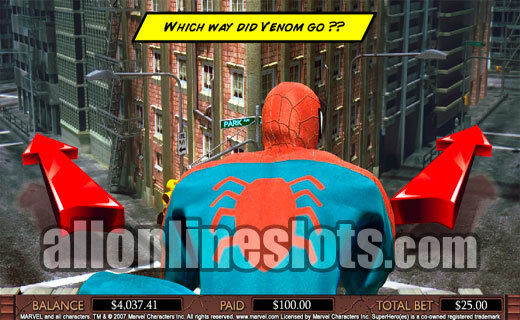 If you select a route that Venom has not taken you get either a crime scene in which Spiderman helps out or a dead end. All of the outcomes offer a different level of bonus payout. Finding Venom awards the biggest prizes on the bonus game. If all of this was not enough you also have the Marvel Jackpot link which awards one of three jackpots on a random basis. These jackpots can hit at the end of any paid spin and range from around $100 to well over $10000. 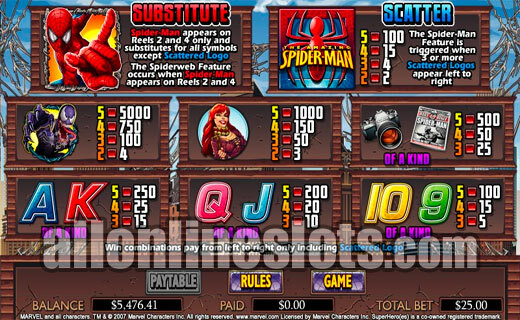 Overall the Spiderman video slot is a great example of just how good online slots have become. 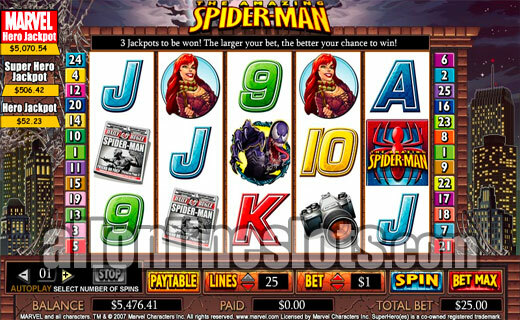 Whether you are a Spiderman fan or not this game is pretty much a must play if you are a slot fan.